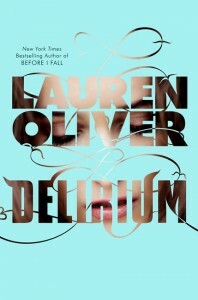 Book review: ‘Delirium’ by Lauren Oliver is amazing! “Delirium” by Lauren Oliver first caught my attention because 1) It appeared on my “Recommended for You” section on my Kindle. 2) I could not believe someone actually wrote a book about a world without love. The main character, Magdalena Holloway, most commonly known as Lena, is a girl who has always lived her life following the rules of the government; people always choosing what was best for her, what she should do and expect out of life. The setting in the book is in dystopian United States, where love has been considered a disease. People get “cured” of love when they turn 18, the government at this age will pick the right college for you, pair you up with your spouse, determine how many children you’ll have, etc. By getting “cured” you will lose any attach to anyone or anything basically, life will be rather painless and each day will follow the same routine. From the moment kids are born up until they turn 18 they are exposed to getting infected (with love) so the government segregates boys and girls, prevents all types of contact, unless the contact is between someone uncured and a cured, and still it would be very frown upon for people to touch. The government set up spies within the population, to control the people and make sure no one was doing something illegal, for example: hugging, kissing, listening to music that talked about love, reading poems, etc. When the US first started eradicating love, all the people who were against the cure were simply called the “Invalids” and most were either killed or sent to The Wilds. Everything beyond the border of the US is referred as The Wilds, where once the war between the government and the Invalids broke out, they were sent to the forest which were completely inhabited and with no technology whatsoever, to live there since they couldn’t live according to the rules. The book starts with Lena, 90 days before getting cured, going to her 1st evaluation. For Lena, who hasn’t known any better than to do what she’s told, she’s excited about getting the cure, being able to feel nothing and find the happiness she wants through the security of her limited options. Things change on the day of her evaluation, not only she gets all her answers wrong, but a protest by the Invalids breaks out in her evaluation building, which leads to some guy walk into the room and “doing the unthinkable“…wink at Lena. Well there’s your plot. Dystopian US banned love; Lena is now bound to find out who was the guy who winked at her in the midst of the chaos. This book was great and I wholeheartedly recommend it. At the beginning of each chapter you get like an excerpt from some research about the consequences of a disease called Love a.k.a Amor Deliria Nervosa, and how professors, doctors, even Bible writings all have something to comment about the “disease”. I think it was very clever of the author to research and make up believable excerpts from books that made me feel like I was living in this society, and how even today love could be determined as a disease, I mean we all die when we have it or by the lack of it. The book had a great pace and good background story about Lena, you get to understand where she’s coming from and why she wants this cure so desperately even though she has never been in love or in the worst case, even said the word “love”. Without spoiling it too much, you know Lena wants to find out who is the guy who winked at her, why did he do that, why was he there at her evaluation room at the exact moment the protest broke out, etc. Lauren Oliver does a fantastic job setting up this society that seemed very realistic for me, like in a few years from now who knows if it wasn’t only Plato back then who said love was a disease? Maybe our children will blame it as the cause of all of our troubles, our wars, and our economy? If you bump into Delirium (like I did) don’t put it down, get it now you fool! You’re guaranteed an amazing story with unexpected twists and it will make you skip heartbeats every so often. Delirium is available at our TYF Store! Next Article VG Tuesday: This Week's Video Game News!